The galley of a ship can be home to some of the most pleasant smells and some of the most pungent odors. It is the place where food is prepared and memories are made yet nobody likes to clean the galley because messes abound here there and everywhere. 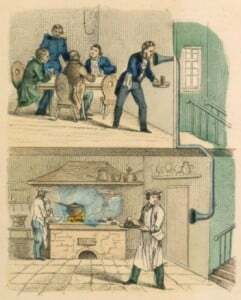 Unlike a home kitchen, cooks in a galley are subjected to the constant movements created by rollicking waves and raging storms. They must cook in all kinds of conditions and while galleys and the cooking equipment in them are specially designed with these unique needs in mind, there are still sure to be some spills and messes to wipe up. Smaller space, bigger responsibilities. When the galley space is small, one might think that it is easier to clean up in general. In fact, sometimes a small space demands more attention because there is no room to fall back on. Didn’t feel like doing dishes at home? Just stash them in the dishwasher or stove or pile them on the counter. Didn’t feel like doing dishes on the boat? Leave them in the sink. Now, when meal preparation rolls around again, who is still going to have space to work? Not the galley cook, that’s for sure. Get a grip on grease. Whether the galley is a small compact space equipped with just a two-burner stove or a more elaborate set-up, kitchen grease is likely to be a cleaning culprit that will have to be dealt with. Spritz the stovetop and counters with a degreaser and wipe away all the greasy evidence. Don’t wait until there is a heavy build-up to do this. A quick swipe each day you’re on the boat will keep issues at bay. No guts, no glory. If you’ve been out on the boat fishing all day and brought a prize catch into the galley, you’ll need more than an ordinary kitchen cleaner to take care of the mess of blood, guts and scales. Tee Pol II Cleaner is a heavy-duty cleaner and degreaser that is effective in salt or fresh water. It is particularly useful for the galley floor and cost effective as well. To use, simply apply to the surface, scrub with a hand mitt, cloth or deck brush and rinse. Tackle food lockers. One thing you don’t want to neglect on a ship is the food supply. On a regular basis, take the time to inspect food lockers for outdated products, loose crumbs and general spoilage. Anything that has gone bad and leaves behind spills or crumbs is a sure way to get a bug or rodent infestation. Inspect cabinets and drawers. Besides food and kitchen equipment, the galley is the perfect place to store serving dishes, pots, pans, utensils, glasses, dishware, kitchen linens, potholders and other types of equipment. The drawers and cabinets that these tools are stored in should be wiped down with a solution of soap and water or a kitchen cleaner regularly. Don’t sweat the small stuff. The good news is that while tight quarters call for a consistent cleaning schedule, smaller appliances mean less time it takes to get them clean. If the galley has a refrigerator, stove or microwave, they are likely small versions than the ones on shore, so they will take a smaller amount of elbow grease to clean. Maintain cleanliness between cleanings. Choose the right cleaning products and you’ll be able to maintain a fresh fragrance throughout the day in the galley, not just after food preparation or a scrub-down. Room deodorizers and other fragrant products are available at Worldwide Janitor. This entry was posted in Food Service, Marine Applications and tagged boat, kitchen, marine, ship, Tee Pol II. Bookmark the permalink.